A friend’s daughter was celebrating her 3rd birthday and I was asked to make the birthday cake. I was well chuffed, but also rather nervous – you don’t really want to mess up someone else’s birthday cake. Anyway, as soon as she asked me, I knew exactly what I wanted to do. The rolo cake I’d seen on Jac’s Tinned Tomatoes blog, over a year ago now, had made an impression and I was waiting for the right opportunity to make it. Jac in turn had got the recipe from The Caked Crusader and it was actually hers I used. Jac tends to use US measurements and I’m not a fan of cups. I did increase the measurements a bit anyway as I was using a larger cake mould than the one specified. Whilst shopping for the rolos, I had a bit of an unexpected dilemma. Not being in the habit of buying them, I hadn’t realised they were made by Nestle – oh dear! I haven’t knowingly bought anything from Nestle since I was old enough to form an opinion on such matters. Okay, I thought I’ll do without the rolos and go for a large bar of Cadbury’s caramel chocolate instead. As I was picking the bar up, however, I realised how ridiculous the whole thing was. Cadbury’s has recently been taken over by Kraft – well, as far as I know, they are no more ethical than Nestle. For want of a better alternative, I have continued to buy Green & Black’s, despite them now being owned by Kraft. So I pulled a face and bought the rolos. Creamed 220g unsalted butter with 220g caster sugar until pale and fluffy. Beat in 4 duck eggs, one at a time and mixing in a spoonful of the flour between each egg. Sifted in 170g flour (mostly white with a bit of wholemeal spelt), 50g cocoa and 1 large tsp baking powder. Mixed in 1 large spoonful of Greek yogurt. Chopped 20 rolos (2 packets) in half and stirred those in. Spooned into a 22cm cake mould and baked at 180C for 40 mins until the cake was well risen and cracked on the top. Turned out onto a wire rack and left to cool. Creamed 100g unsalted butter together with 150g icing sugar and 2 tbsp cocoa. Added a glug of toffee syrup and beat until smooth and light. Spread this over the cold cake. 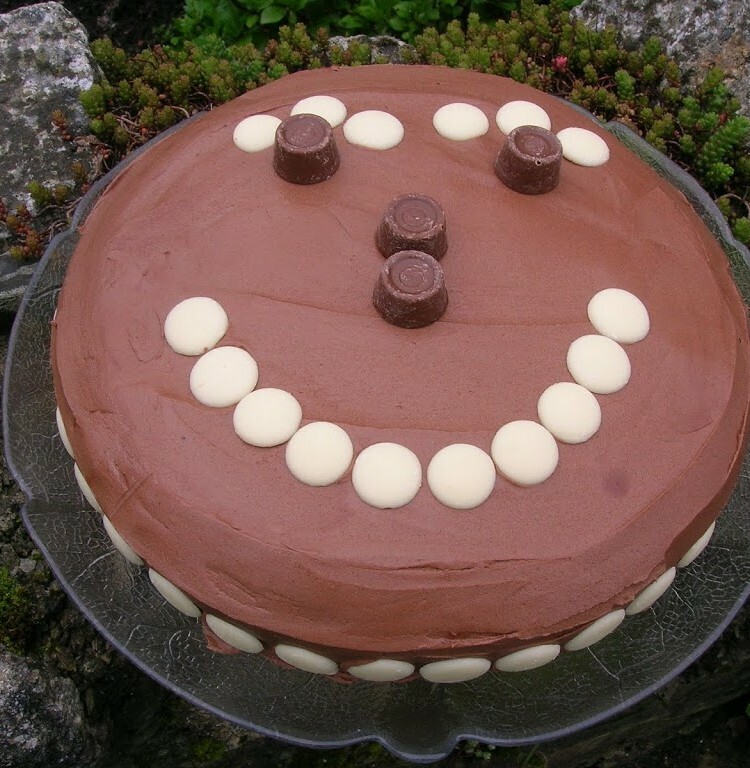 Attempted to decorate with a happy face on top of the cake using rolos and white chocolate buttons. Luckily, I needn’t have worried; the cake proved to be a huge success and was enjoyed by adults and children alike. The birthday girl showed her appreciation in the usual way. Although I wasn’t there, a slice was very kindly kept back for me so that I could try it. It was moist and tasty with slightly chewy melted toffee bits in the middle. I’d be happy to have this for my birthday cake whatever my age. I’ve made a choccamocha caramel cake using green & blacks caramel choc stirred through the mixture: then melted ones with butter and icing sugar for the topping: only for special occasions due to massive sugar content! I’d like to put on order in for my birthday please!! Looks wonderful. What a lovely birthday cake! ChocolagteGirl – that sounds like one hell of a cake – good as cupcakes too I expect. Suelle – thank you. Cake decoration is not really my thing (as you well know) but everyone seemed pleased with this. Chele – and how many candles would you like? He he, no answer required. It looks really moist and delicious! I love your smily face for the birthday girl! That looks gorgeous and is just soooo cute!!! My biggest disappointment in life was finding out that Ben and Jerry’s ice cream was owned by Unilever 🙁 Lost my faith in ice creams for a while there! I started reading this thinking “I’m sure I made something similar to that” and then saw that it was the same cake! Glad you loved it as much as we all did! it’s a tuff one choclette… like you, convenience would have led me to buy the rolos but time would have rendered me making my own caramel… but like you say, even G&B are owned by Kraft… there’s no escape! At least you had the prinicple in the first place! It does look like a stunner of a cake though, so it’s good how it turned out. I like the fact you’ve put some spelt flour in the cake too. She must have been one happy 3 year old! Will def have to have a go at making this one. As soon as sweeties are included in the recipe I am immediately sucked in. It does look wonderfully moist and scrummy. Yum is all I can say. My wife used to make a gooey chocolate cake with mars bars in it but it’s now banned because of the impact on the waistline. C – thank you. Glad you liked the face – am never very sure about my decorating abilities. Michelle – the Ben & Jerry’s experience is repeated a lot. Small ethical business does well – bought out by big (and often unethical) business. Brittany – Thank you. Surprised to hear there are no rolos in Australia. Johanna – Thank you for your lovely words. I find it gets forever harder to shop ethically rather than easier. Dom – I’m pretty conscientious about what I buy most of the time, so I try not to give myself too hard a time – it’s not easy though. MCB – I do like to squeeze a few healthy things into my baking where possible and I think spelt works really well in cakes. SewHappy – it sounds as though I’m leading you astray. Phil – I suppose your wife couldn’t be persuaded to pass that recipe on – just in case you understand? Lovely cake! Rolos are my dirty secret and this cake sounds perfect! Oh, I know what you mean.. it is so hard to find ethical products on the shelves, everything is always owned by a big shot company. I try to avoid it as best I can, but sometimes hard to explain to kids and make them understand your reasons. Luckily, Master 10 has learned about Fair Trade at school and that was helpful. Hehee. Haven’t heard of rolos in YEARS! Was there not an advert, who’s stolen my rolo, or something? One thing is for sure, it would be difficult not to steal this b’day cake. Looks just fabulous with the gungy caramely inside! What 3 year old wouldn’t be happy with that cake though! I couldn’t think of a better cake for a young lady’s 3rd birthday, very cute! Green and Black’s is owned by Kraft now? Crumbs, when did that happen?! Luckily here we can still buy excellent locally-owned AND produced chocolate – which makes it practically guilt-free (but no less easy to resist). Lovely cake! LF – yes, it must be especially difficult if you have children. Thanks Jill – I do remember an add that went along the lines of love is giving away your last rolo. CityHippy – Cadbury’s was taken over about a year ago now. It may not have produced particularly good chocolate, but at least it was British. KitchenMaid – yes, all very sad. There are still UK chocolate makers, but they are more niche and therefore a lot more expensive. The only chocolate I remember in NZ was Cadbury’s, but that was a long time ago now. Have not eaten rolo’s in years, preferring the ones Ikea sell but I love the design on the cake, so cute! Looks delicious and chocolatey too! Anne – thank you. Had no idea Ikea sold anything other than Dime bars. Good analogy kate. It’s very annoying when you make something good and haven’t got a decent photo to reflect it. Oxslip – ethical shopping is a never ending dilemma. I do use co-op chocolate too, especially the orange and spice. Lucy – thank you and glad it made you smile – that’s what I was hoping for.